As we approach the World Cup, for women’s fifteens (as Charles Dickens might have said) it’s the best of times, or is it the worst of times? For anyone who follows women’s rugby – especially women’s fifteens rugby – the last year or two have seen more ups and downs than most roller coasters. Even before a World Cup that will appear live on free-to-air TV in the UK for the first time (only three years after this milestone was broken in France, bringing with it spectacular rating from which their game have never looked back) we had an unforgettable Six Nations this year, building on previous years, but now with every game available with broadcast quality streams, record breaking crowds, and a title going down to the last game. It is not an exaggeration to say that interest in women’s test rugby – at least in the countries that play it - has never been higher, along with the standard of play. 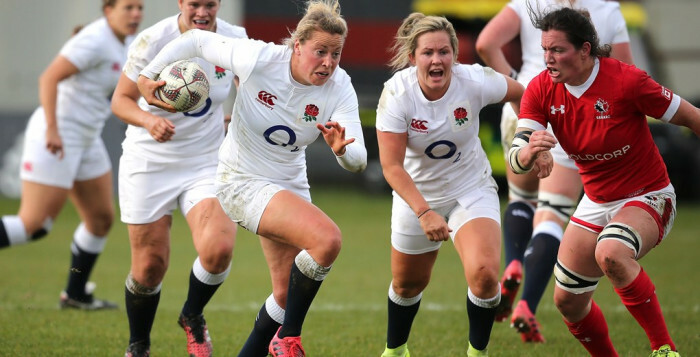 Women’s test rugby was making headlines – surely commercial sponsorship could not be far behind? One worrying fact, for lovers of test rugby, is that this year’s World Cup had its lowest entry ever (or at least since it ceased to be a largely invitational event). Just 18 national unions entered teams, including the seven who were granted automatic places. 18 nations is a very small world. An exciting Asia/Africa/Oceania qualifier quickly descended into near farce with the top three expected participations – all of whom had been in Paris in 2014 – pulling out, for one reason or another, leaving Japan and Hong Kong to go through the motions only challenged by a Fijian team playing in just their second test match for a decade. And even beyond the World Cup, test rugby is not a game in rude health. In the three years before the 2010 World Cup 41 teams player 183 tests. In the same period before 2014, 32 teams played 149 tests. In the three years since the last World Cup just 29 teams have played only 121 tests. At this rate test rugby will have all but disappeared by the 2025 World Cup - if there is one. And if it hasn’t, it will be a curiosity played by a handful of nations, mainly in western Europe. The RFU’s fifteens contracts – the first and only nation to offer such opportunities to its players – was a massive step forward, and showed their worth almost straightaway, with the superior fitness of the England team dramatically turning defeat into victory against France in a classic opening game. Given this step you felt that the rest of the Six Nations were really going to have to follow suit or be left behind. All of that positivity has been largely lost in just a few days. Even accepting all of the RFU’s case – that the contracts were only for a year, that the players knew this, that no other nation offered contracts at all, that it was all about retaining the World Cup – there can be little or no doubt that the controversy has been handled appallingly badly by the RFU. It almost does not matter if the RFU’s policy is correct, it is perception that matters. Having built up expectations for a new era for women’s test rugby in a whirlwind of glitzy publicity it was foolish to think that they could take it all away again without anyone noticing. The big increase in media coverage, crowds, and TV audiences players were beginning to become real stars. Grounds were selling out, and not just in France, but in Ireland and Italy. Even though Wales’ game against England did not fill the Arms Park, but (by some accounts) it made money. Not a lot, but getting onto the black side of the balance sheet is a huge thing. The 2010 World Cup was designed by the old RFUW and RFU primarily to keep costs to a minimum after the 2006 tournament had left the IRB and Rugby Canada with bit of a financial hangover. It worked and the tournament made only a small loss. The same model was followed in Paris in 2014 - and crowds of spectators were being turned away. Come 2017 on a rising tide of interest in the game perhaps the time might have come to move on from this risk averse model and maybe maximise possible income? No. Which is why UCD has sold out weeks ahead, with however many thousand potential spectators now just watching on TV. So women’s test rugby remains a financial drain on World Rugby, the poor side of the game begging for support when it could, just possibly, – in big events at least - be starting to stand on its own feet. Although the number of tests played over the last three years has fallen, in the last year or so the fall has slowed. For the first time in many years a new team– Papua New Guinea – made their test debut, and test teams and programmes have been revived in Botswana, Fiji, Finland, Germany, Russia, Sweden, Zambia, and Zimbabwe. Some of this has come about through player power –demand by players to be able to play 15s rugby for their country (most notably in Germany). Away from the international stage, players in countries like Brazil have begun to dip their toes into 15s. And just to encourage them a bit more, World Rugby now has women’s test rankings – so unions, spectators and players can have ambitions to see they team climb the ladder. Whatever anyone else may want, the Unions and World Rugby want sevens. If the RFU contract debacle has shown anything at all it is that, in the very birthplace of rugby, sevens rules the roost, even though the media, and spectators show little interest in it (unless it’s part of a big party). Even men’s sevens attracts almost no coverage in the UK, even when home nation teams are winning. Yet from next winter this is where most of the leading players from the World Cup will be. Excited young fans who watch the World Cup on TV and want to see their heroes pulling on a national shirt live will be disappointed, unless they can get out to Dubai or Sydney because (with a certain irony) no Home Union will host international sevens because it costs too much. Indeed it is no exaggeration to say that some England stars will never pull on an England shirt at home until at least 2020, if ever again. This matters because personalities sell sports, but if all the leading personalities from the World Cup effectively disappear after August, spectators, potential sponsors and TV executives excited by what they have seen over the last year may just start turning away to something more reliable. Any fan of women’s test rugby will have an August of delights ahead of them. Who cares how many teams entered, the best 12 teams are arriving in Ireland (more or less – sorry Scotland) for what promises to be the most open, most exciting, most high quality, most accessible (on TV at least) World Cup ever. A two week glorious celebration of the game that cannot fail to attract new fans and players (of all ages). And then that will be it, as far as top quality women’s test rugby is concerned, until 2020? Is test rugby now destined to be the mayfly of the game – every four years an Autumn Series to shake the rust off, a Six Nations to get the pulse racing, World Cup to savour, and then three years of sevens goldrush until it all comes round again? This is not meant to be a diatribe against sevens. Sevens is a great sport, but it is a sport for the usual athletic type – which why so many players have managed to switch to it from so many other sports. A whole raft of great rugby players from Rocky Clark to Gaelle Mignot to Fiona Coghlan, to up-and-coming stars like Amy Cokayne, would have no place in a sevens team – certainly not at international level. And women’s sport has been here before. Women’s cricket put its weight behind a shortened, cheaper form of the game to help developing nations – and women’s test cricket is now (apart from games between literally just two countries) dead. If the test rugby has to play second fiddle to sevens and is only prioritised in years where there happens to be a World Cup (if there is another World Cup - we all assume there will be, but the silence on potential venues is deafening) then it is heading in the same direction. So where are we in this roller-coaster ride? Are we on the way up or on the way down? Is this the best of time for women’s test rugby, or the worst of times? Or is it, somehow, both? John Birch is a wide ranging contributer to this website, penning detailed previews and reviews of the game from around the world. John has also established a superb fixture archive on the women’s game which are listed on Wikipedia.